Manchester United midfielder Adnan Januzaj has committed his future to the club by agreeing a new five-year deal. Januzaj, 18, scored both goals in his first competitive start for the Premier League champions in their 2-1 win at Sunderland on 5 October. "It's a great thrill to be able to sign for Manchester United," the Belgium-born player told the club's website. United manager David Moyes described Januazj, who arrived from Anderlecht in 2011, as "truly exceptional". Januzaj's contract had been due to expire in the summer, meaning he could have left Old Trafford for a minimal compensation fee as he is under 24. 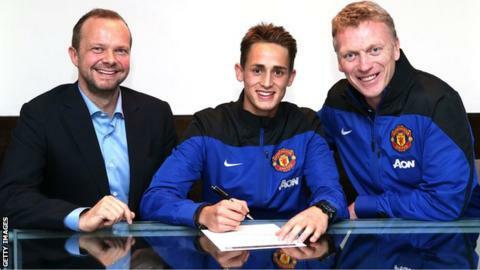 "It's like a dream," added Januzaj, who excelled in United's youth and reserve teams after joining as a 16-year-old. "Since arriving here I have always felt like this was the right club for me." Although named as a substitute in Sir Alex Ferguson's final game in charge of United in May, he has played a more prominent role under Moyes and has impressed since appearing as a substitute in the Community Shield win against Wigan in August. "He is an outstanding talent," said Moyes. "His balance, poise and ability to beat players is truly exceptional for a boy of his age." Januzaj's new deal means United have potentially avoided a repeat of the situation that saw highly-rated midfielder Paul Pogba move to Juventus once his contract expired in 2012. The 20-year-old has gone on to become a regular for both the Serie A champions and France. Uncapped Januzaj is still to commit to an international team and is eligible for the country of his birth, Belgium, as well as Albania, Serbia or Turkey through his parents and grandparents. Belgium coach Marc Wilmots said he had been told the player had made no decision about who to represent after he tried to call him up for the recent 2014 World Cup qualifiers against Croatia and Wales. England manager Roy Hodgson also told Match of the Day that he had been monitoring him. Under governing body Fifa's rules, Januzaj would have to wait until 2016 to represent England, assuming he remains in the country until then. But the chances of that happening appear slim, as England, Northern Ireland, Scotland and Wales voluntarily agreed to opt out of the residency rule in 1993.